Australian musical theatre star, Peter Cousens, has reinvented himself as a film director, and his debut feature is not a cheap slasher horror or gritty suburban crime thriller, but a big budget drama tackling important social and historical issues, shot in the US with a big name cast. Aspiring filmmakers should be jealous. I know I am. Coming hot on the heels of Django Unchained and other slavery themed productions, it is easy to dismiss Freedom as Twelve Years A Slave-Lite but Cousens’ feature is a very different creature altogether. Screenwriter Timothy A. Chey runs two plot lines in parallel. The first is set in 1856, following slave Samuel Woodward (Oscar winner Cuba Gooding Jr.) and his family as they escape from a plantation in Richmond, Virginia and begin their dangerous journey to Canada on the Underground Railroad. Not far behind throughout their journey is slave hunter, Plimpton (William Sadler). Almost 100 years earlier, we meet ship captain John Newton (Bernhard Forcher) who is struggling with his faith and conscience as he transports slaves, including Samuel’s great grandfather, to the New World. This reviewer found the second plot line to be the least effective. Although developing a human connection to his cargo through a series of incidents at sea, Newton’s final expression of kindness is to pen the hymn, “Amazing Grace”, not save anybody from their hell-like future existence. I suppose the song does provide Samuel and family some comfort and motivation a century later. It may also have helped my understanding of the film had I been aware that John Newton composed the iconic song. Pardon my ignorance, I assumed it was written by God. Samuel’s tale, on the other hand, is a gripping tale of escape and near recapture, and I was willing Gooding Jnr. and co to get across the border throughout the whole 98 minute runtime. Although not a musical, Freedom uses music, in particular singing, as a metaphor for the humanity that we all share. I was moved by some of the numbers, sung in their entirety, such as the joyous singalong between the escapees and a troupe of theatre performers, including Australian musical theatre headliner Tony Sheldon. Less successful were a few songs, performed out of context, musical theatre style, especially Samuel’s wife Vanessa (Sharon Leal) breaking into tune whilst walking inside a church. The result was being snapped out of my engrossment and remembering that I was watching a film. Freedom was shot on location in Connecticut. It looks beautiful, courtesy of cinematographer Dean Cundey (Back to the Future, Apollo 13). The cast is wonderful. I have no idea how Cousens’ managed to enlist such a lineup for his first feature. Cuba Gooding Jnr. really delivers in his best performance in years as his Samuel struggles between the choice of revenge or freedom. William Sadler is capably menacing as a slave hunter with ethics. Even one of my favourites, Terrence Mann (The Dresden Files, A Chorus Line) makes an appearance. Peter Cousens has concocted a beautiful and haunting film which will appeal to a “Best Exotic Marigold” audience. Despite its religious undertones which frankly did not bother a non-believer like me, Freedom still has plenty to say about slavery, an issue which is just as relevant now as it was in 1748 and 1856. This column was originally published in the Central Western Daily on Tuesday 9th April 2013. Many, many moons ago, for my twelfth birthday party, I compiled a wish list of cassettes that I wanted to receive from my family and schoolmates. For the uninitiated, cassettes were the precursor to compact discs and had a tendency to melt in the car on hot days in summer. They were also much harder to use as drink coasters. My list was varied and contained just as many albums that would be considered classics as embarrassments. For every Crowded House debut album, there was a Rick Astley disaster. For every Kick by INXS, there was a Tiffany album. As always, I will deny owning these terrible albums if asked (I’m still talking to you, Doug, the newspaper guy). One cassette I loved from the moment I pressed play was Graceland by Paul Simon. My gateway track was the hit single You Can Call Me Al, which featured a music video starring Chevy Chase, back when he was funny (he later became funny again in the hit comedy series Community but sadly left the show last year, which for fans like me wasn’t funny). Graceland was the amalgam of Simon’s pop and folk roots and his discovery of South African music. Every track is a gem and the album, which celebrated its 25th anniversary last year, is still on regular rotation in my home and car (on CD even). So it was with great excitement that I witnessed a 70 year old Paul Simon in concert at the soon-to-be-demolished Sydney Entertainment Centre last Tuesday night. I missed his support act, Rufus Wainwright, but heard some audience members giving him scathing reviews in the foyer, so I may have dodged a bullet there. Opening with the Graceland classic, Gumboots, it was clear that the capacity crowd were in for a musical treat. Simon’s eight piece multi-instrumentalist backing band was absolutely remarkable and recreated the sound of the Graceland tracks, in particular, flawlessly. In his awkward introductory speech, Simon announced that he wanted to play an upbeat set, which was fine by me as I had just driven for three and a half hours from work and had the same journey ahead of me immediately after the concert. Hit after hit followed in rapid succession: 50 Ways to Leave Your Lover, Me and Julio Down by the Schoolyard, The Obvious Child. Unfortunately, the overzealous security folk kept those wanting to dance in their assigned places, however, with a largely baby boomer audience, arthritis may have also been responsible for everyone else staying comfortably seated. Simon performed six Graceland tracks during the show, including You Can Call Me Al, as well as songs from his earlier solo work right up to his new album, 2011’s So Beautiful or So What. He also performed some covers including a beautiful version of George Harrison’s Here Comes the Sun. Returning for his third encore, Simon announced that he felt like playing some Simon and Garfunkel tracks and sent us all home after two hours of pure musical bliss with joyful renditions of America, Homeward Bound and The Boxer. I might have shed a tear or two during the final track. I said “might have”, Doug. This column was originally published in the Central Western Daily on Tuesday 12th March 2013. In my very first column for the Central Western Daily way back in 2009, I discussed my interest in microloans via kiva.org. This fantastic non-profit organisation allows investors worldwide to collectively loan small amounts of money to entrepreneurs. No interest is charged by Kiva and when the loan is repaid, investors may reinvest their $25 share in another project. Since then, this model of collective finance has become popular and is now known as crowdfunding. There are many different platforms for investors and entrepreneurs but the emphasis has shifted away from loans towards investment and incentives. Music fans can purchase “parts” in musicians and bands through sellaband.com and receive limited edition CDs should enough investors pledge to fund a new project, usually an album. Kickstarter.com, pozible.com and indiegogo.com allow punters to invest in creative and technological projects in exchange for incentives. There are literally thousands of projects available, from short films and theatre productions to books and inventions, each with its own range of incentives and offers. For a dollar or so, you might get a thank you acknowledgement online. For $20 – $50, you may receive a DVD, CD or t-shirt. For $1000 or more, you may receive an executive producer credit on a film, or a private gig with your chosen band. Like all investments, there is an inherent risk. There have been reports of some entrepreneurs disappearing after funding has been released as well as complaints about extended delays with fulfilment of incentives. 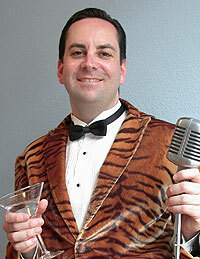 One of the many success stories of crowdfunding has been lounge singer Richard Cheese, portrayed by Mark Jonathan Davis. With cheeky album titles such as I’d Like a Virgin, Aperitif for Destruction, Tuxicity and Lounge Against the Machine, Cheese has developed a cult following for his swinging arrangements of popular hits. To date, two new Richard Cheese albums and a biography have been crowdfunded via kickstarter.com. With a busy tour schedule, online merchandise store and worldwide fanbase, I assumed RC could be considered a successful independent musical act, so I was surprised to receive an email inviting me to participate in another Richard Cheese crowdfunding project, corneal transplant surgery. Cheese is seeking $19500 to help fund the surgery on his left eye. Cursed with congenital eye problems since birth, RC has been unable to get health insurance and had been saving towards the vision restoring operation until two unplanned abdominal surgeries over the past year wiped out his finances. With failing vision, it has become almost impossible to tour and music piracy has decreased his income from record sales. After pledging $35 towards RC’s operation in exchange for a signed photo, I went for a quick scout around indigogo.com and found over 1000 different health related projects seeking funding, from assisting a stroke victim to return to work, to a couple wanting financial help to adopt twins. A week later, I still have mixed feelings about crowdfunding shifting into the realms of health. Firstly, it’s a sad indictment of the American health system and I’m really glad I live in a country with Medicare. However, I’m impressed by the ingenuity of Richard Cheese and others to seek alternate means to improve their health. On the other hand, I’m concerned about the lack of fairness in an open market where the flashiest project may get more attention than others, which may be just as worthy. What do you do if you don’t have CDs and autographed photos to give away? Anyway, whilst pondering the pros and cons of health crowdfunding, please visit indiegogo.com and send a few bucks towards my (or your new) favourite lounge singer, Richard Cheese. This column was originally published in the Central Western Daily on Tuesday 20th November 2012. Aussie music fans were not at all stunned last week with the not particularly shocking announcement that INXS were calling it quits after 35 years as a touring act. On the final night of a tour supporting Matchbox Twenty in Perth, drummer Jon Farriss informed the Perth crowd that they were witnessing the last live performance of the band that at one time were Australia’s biggest musical exports. My earliest memory of INXS involves dancing along to Original Sin during a sleepover at a mate’s house. The year was 1984. The album was Throbbin ’84 (on cassette). At the time, neither of us even knew how to pronounce INXS. As far as we were concerned they were “ink-sus” (rhyming with sphinxes). A few years later, MTV arrived on our shores, though not as we know it today. Pay TV was still a few years away. MTV first aired in Australia as a three hour late Friday and Saturday night music show on the Nine Network, hosted by Richard Wilkins, complete with mullet. Each year, as a special, the MTV Music Awards was also broadcast. I still have the 1986 awards on videocassette somewhere which features an in form INXS performing What You Need. In 1987, INXS released Kick and the rest is history. Selling over ten million copies worldwide, Kick is a perfect forty minutes of pop. Featuring the singles Need You Tonight, Devil Inside and Never Tear Us Apart, the album launched the band into the stratosphere and for a few short years INXS was arguably the biggest band in the world. I really must put the special edition Kick 25 reissue on my Christmas wish list. I love that album. Flashforward to the mid-nineties and INXS had begun to lose their shine. Creatively the band had not been able to match Kick and sales had slumped. It was during preparations for their “comeback” tour in 1997 that Michael Hutchence committed suicide in a Sydney hotel room. I had front row centre tickets for the first of these comeback gigs at the State Theatre. What a bummer. Rather than retire the INXS name, the remaining members continued to tour with a succession of singers, making them one of those rare creatures in the music industry: a band that transformed into their own cover act. I finally caught INXS (with ex-Noiseworks singer Jon Stevens) live in Cardiff on a double bill with Blondie. It simply wasn’t the same. Michael Hutchence had a unique stage presence and charisma that was irreplaceable. A little later, a new singer, Canadian J.D. Fortune was promoted to vocal duties via a TV talent search. Although his Michael Hutchence impersonation wasn’t bad, J.D. only lasted one album before being dropped for Irishman Ciaran Gribbin. As far as I’m concerned, INXS ceased to exist in 1997 with the death of Hutchence. It has taken 15 years for the other band members to understand this but I think deep down most fans would agree with me. Just like The Doors without Jim Morrison or Queen without Freddie Mercury, INXS were simply not the same without their charismatic frontman. This column was originally published in the Central Western Daily on Tuesday 25th September 2012. Unless you’ve been under a rock, or at least a rock without an internet connection, it’s been pretty hard to avoid a kooky music video from South Korean pop star, PSY. His high energy performance, along with its irresistible horse riding dance, has made the video to “Gangnam Style” a viral hit on YouTube with over 251 million views to date. The song is currently sitting at the top of the Australian iTunes downloads charts and has hit the top spot in 30 other countries. Start the clock. PSY’s fifteen minutes starts now. In celebration of K-Pop (Korean pop music) hitting number one for the first (and most likely last) time in Australia, here are my five favourite one hit wonders that were (mostly) not sung in English. 5. 99 Luftballoons – Nena Ok, this one is a bit of a cheat. Originally recorded in German, 99 Luftballoons was a 1983 hit in Germany, which prompted an English language version a year later entitled 99 Red Balloons. It was this single which topped the Aussie and UK charts. Apparently the song is about children releasing a bunch of balloons (99 in fact) which float into the air and trigger a military scramble which results in nuclear annihilation. That must be why parents tie helium balloons to their kids at the Easter Show. It only takes a couple of kiddies to let go of their balloons and we’re all doomed. 4. The Ketchup Song (Aserejé) – Las Ketchup This ditty, sung in spanglish, topped the charts in 2002 and sold over 7 million copies worldwide. That’s an awful lot of CD singles in landfill. The four members of the group were all daughters of a famous Spanish flamenco guitarist known as The Tomato. Only three of them appeared in the music video because the fourth one was pregnant at the time. Insert your own tomato related joke here. The group followed up their hit single with a Christmas version of The Ketchup Song. What did we learn from this? Adding sleigh bells to an annoying song does not make it less annoying. 3. Macarena – Los Del Río Speaking of flogging a dead horse, this worldwide smash in 1995/96 was also followed up with a pointless Christmas version. Los Del Rio were essentially a Spanish lounge act who accidentally sold 11 million copies of their horrible song with its associated horrible dance. Fortunately the group broke up in 2007 before there could be any further accidents. Let’s not speak of this ever again. 2. La Bamba – Los Lobos East LA group Los Lobos topped the charts in the UK, US and Australia with their 1987 hit from the soundtrack to the Ritchie Valens biopic, La Bamba. Unlike Valen’s career, which lasted all of 8 months before his unfortunate death by gravity in 1959, Los Lobos are still recording but have not been a threat to the charts since La Bamba. Perhaps they should have considered a Christmas version? 1. Ça plane pour moi – Plastic Bertand Everything’s going well for me. Everything’s going well for me. Repeat this in French ad nauseam and you have yourself a hit single. In 1977, this punk rock novelty, with its bouncy music video, graced charts worldwide. It was recently revealed that Belgian Plastic Bertrand did not actually supply the vocals for this song. Producer Lou Deprijck was responsible but was deemed too unattractive to front the record. I guess everything wasn’t going so well for him. This column was originally published in the Central Western Daily on Tuesday 19th June 2012. I love a good pop song. Always have. Probably always will. As a kid, I’d hang out at the newsagency near my bus stop every weekday morning. Each fortnight, the latest issue of Smash Hits would hit the newsstands and I’d usually have it read by the time I got to school. My favourite part of the magazine was the song words pages. At the time, there was no quick and easy method, such as the internet, to look up the lyrics to the latest pop songs. If you were lucky, a cassette sleeve might have the lyrics, but most of the time it came down to Smash Hits magazine or just listening to the song repeatedly until I worked out the words. Or at least thought I had worked out the words. Occasionally, I come across a pop gem that on scrutiny of the lyrics, appears to make absolutely no sense. The song probably has some meaning to the writer but every now and then, I’m certain that it’s all a conspiracy to make millions of people around the world sing ridiculous lyrics. Here are my top five prime offenders. 5. MMMBop – Hanson Cute as three cloned buttons, the Hanson brothers peaked at number one in 1997 with this ditty about well, nothing. The chorus is phonetic soup. On closer lyrical inspection, I think that an mmmbop is a unit of time. So in that case, it is safe to say that Hansonmania lasted about an mmmbop. 4. I Am the Walrus – The Beatles I know it’s hard to believe but there are actually bad Beatles songs. For every Hey Jude, there’s an Ob-La-Di, Ob-La-Da. Walrus sits somewhere in the middle. It’s almost as if the lyrics are simply a method of delivering a melody to your ears in the same way that corn chips are simply a method of delivering salsa. Is it homage to Lewis Carroll or a salad recipe? You decide. 3. Blue (Da Ba Dee) – Eiffel 65 Apparently Italian dance group Eiffel 65 wrote the tune first with the lyrics coming later. No kidding. This 1999 hit is about a man who lives in a blue world. A lot of his stuff is blue too. How interesting. As you can see by the title, those looking for further explanation need go no further than the clarification of the title in brackets. The Teletubbies really need to stop writing songs. 2. We Didn’t Start the Fire – Billy Joel Yes, I know. It’s a list of historical events. The problem is that the chorus doesn’t really give the verses any perspective. You don’t believe me? Try replacing the lyrics from the verses with your shopping list. It’s pretty much as meaningful as the original. 1. Africa – Toto Surely this ditty must have some deep spiritual meaning? It mentions rain in Africa, doesn’t it? Sing along with me. “It’s gonna take a lot to take me away from you. There’s nothing that a hundred men or more could ever do. I bless the rains down in Africa. Gonna take some time to do the things we never have.” Nope, I have no idea either.